What's It Like on a SQLCruise? 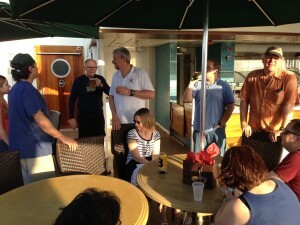 I always seem to get a question or two along the lines of "What's it like on a SQLCruise?" as I present at various conferences, SQL Saturdays, and user group meetings. Since we just finished up the 2013 Miami SQLCruise, I thought it'd be a good time to recap so that you can judge for yourself if you'd ever want to do it yourself. Personally, I think that Tim Ford (Twitter | Blog), together with his wife Amy, are doing better than ever in making the cruise both a top-quality learning experience and fantastic social experience. I've heard from many attendees that they learned enough in the first day or two to make the whole trip worthwhile and, keep in mind, some of these attendees paid for the trip out of their own pocket. 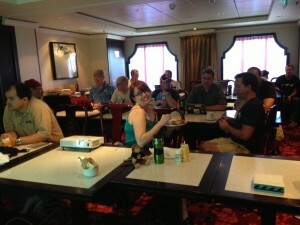 SQLCruise is, first and foremost, a training event. On each cruise, Tim usually pulls together four or five very well known experts in the industry who, in turn present several hours training. Each day the ship is at sea is a day spent in class. Example of the agenda is on the lower right. When the ship is in port, it's a day of activity and adventures. Tim spends quite a bit of time coordinating with the speakers so that the curriculum is both unique and well tailored to the students. But each and every night, whether at sea or in port, is spent in 'office hours'. For many attendees, office hours are their favorite part of the learning experience. Since Tim caps registration at 15 students, that means the students get virtually unfettered access to the experts. If you've ever attended a conference, you've probably encountered that common scenario where the speakers are busy with presentations and, at the conclusion of their session, are mobbed by attendees with questions. They're lucky to get 3-4 minutes of the speaker's time. On the other hand, the students get hours and hours to talk about whatever is on their mind. 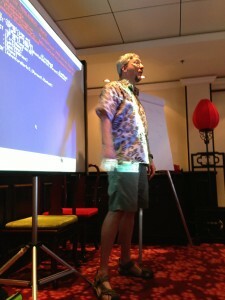 And since we're on a cruise ship in the tropics, office hours usually look like the image at top right. It's both very relaxing and very educational. Another aspect of the content on SQLCruise that makes it unique is the amount of time spent on personal and professional development. The majority of attendees are not newbies. They're mid-career professionals who are doing well and their career and want to take it to a higher level. But as we often find, our earlier years in IT are spent learning how to be really good at the technology part of our career. We like technology and, sensibly, it's the immediate problem we face in day-to-day productivity. But as the years progress and we earn a few promotions, we come to find that rising in the ranks means a lot of communication and, gasp, office politics. The speakers, in many cases, have careers the students would like to emulate. This is where SQLCruise really shines. Imagine being able to pick the brains of senior technologists and managers in a friendly and welcoming environment. How great is that? In fact, many SQLCruise attendees (I know of several from each cruise I have attended) have used the professional counseling they received on the cruise to enact an energetic new phase in their career with big pay raises, exciting new jobs, high-profile blogs, and all sorts of other really cool things like that. 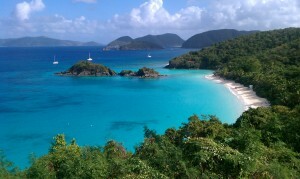 You'll have to suffer through excursions like Trunk Bay on St. John's in the US Virgin Islands. Now that I've told you about the grueling educational side of SQLCruise, did I mention that we do all of this ON A CRUISE SHIP IN THE CARIBBEAN?!? The cruise ships are, if you will, an enormous Vegas hotel on the water. There are casinos, a constant parade of entertainment, live music, comedy, pools and water slides, discos and dancing, live game shows - the works. Ask Neil Hambly (Twitter | Blog) about the dancing! Several of the sponsors also help to put on really fun contests and activities, some of which produce some really funny antics. There are fun scavenger hunts and other team relays which, if you can get over your inhibitions, are a ton of fun. Another aspect that makes the SQLCruise a unique experience is the fact that most attendees bring at least one other person, if not their entire family. That means that there are plenty of people for your significant other to hang out with while you're in class. Kids have built-in playmates, over and above the kids' activities that the cruise line keeps running around the clock. Lots of folks, including me, have also brought along a parent or several parents. They all have a great time and, in many cases, look forward to meeting their new friends again on a future cruise. Would it surprise you if I mentioned that most of the parents are not the type to start emailing each other as soon as they get off the ship? Perhaps the most enjoyable aspect of SQLCruise for many attendees is that you're on a cruise ship in the Caribbean hundreds of miles from bandwidth. That means very limited connectivity. Although I've witnessed a student or two have to miss a class to put out some sort of fire back at the office, this is a really rare occurrence. In fact, it's much less common than what I've seen at the big conferences because you're so disconnected from all fast forms of bandwidth. Yes, there is an expensive sort of satellite connectivity on the ship. But your boss would have to be pretty desperate to keep you on the front lines while on one of these trips. Now I don't know about you, but my training events are always more enjoyable when I don't have the cares of the office weighing on my mind. SQLCruise Instructor Allen White ( Twitter | Blog) teaches about PowerShell for the SQL Server professional at right. Notice his casual but totally appropriate attire. Shorts, sandals, and comfy shirts are the norm even in class. SQLCruise costs less than $200/day for the training. That compares to more than $300-400/day training costs of most commercial training centers who use the Microsoft Official Curriculum (MOC). On the other hand, there's the cost of the cruise itself. 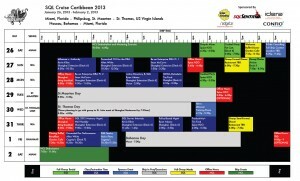 But again, the cruise is all-inclusive for lodging and meals (but not alcohol). So, for me at least, the cost of cruise itself was actually a little cheaper than a standard, nice American hotel chain like a Hilton, Marriott, or Sheraton. Another, less tangible benefit of the expense of the SQLCruise is that the instructors are never unable to answer your questions, compared to many training centers whose trainers have never actually had a career built around the topic they're teaching. It's a huge difference. Finally, if you're weighing the idea of paying for a trip like this out of your own pocket, consider that training expense are tax deductible. In my experience, probably a third of attendees cover their own costs. In a few cases, employers cover the training and the attendee covers their travel expenses. And for the rest, their employers cover the cost. Check out the FAQ and other resources on the website for tips on convincing your boss that this is the right training for you. As an aside, SQL Sentry gave away a full registration to the event - winner Mickey Stuewe is in the center of the picture at right. Congrats Mickey! It's a great event and a great way to spend a week. I hope to see you at a future SQLCruise!